At Brookside, we believe that the church is the people. Community Groups (CGs) are smaller manifestations of that larger whole, the church. Our CGs are where we want to grow toward Him together, inward toward loving one another, and outward in loving those who don't yet know Jesus. Our groups want to be WITH a community, FOR a community. Keep reading through the CG pages or contact Amy Seiffert, Director of Outward Movement (amyseiffert@gmail.com) for more info. If you are interested in joining a CG, click here. There is a lot that can be said about Community Groups. It isn't a Bible study, though CGs do study the Bible; it isn't an event or meeting, though CGs do meet; it isn't an outreach group, though CGs will meet and bless the lost. 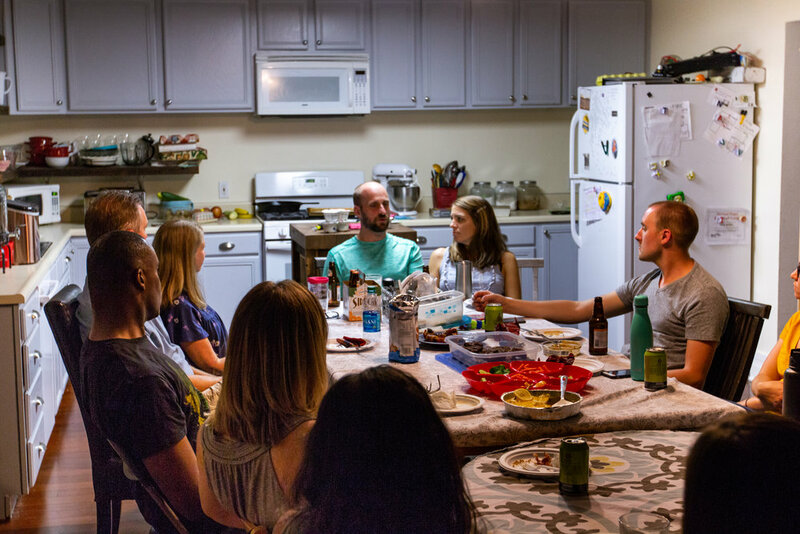 A Community Group is "A Family of Disciples of Jesus Sent to BLESS a Pocket of People." WHAT IS A COMMUNITY GROUP AND WHAT DOES IT DO? "A family of disciples of Jesus sent to bless a pocket of people." Who are we?—“A Family of Disciples of Jesus Sent to BLESS a pocket of people. Said another way: What is a community group? They are a spiritual family of people that call Jesus Lord; they are a family of disciples of Jesus. And, they are sent by Jesus into the world to demonstrate and declare His good news; people who are Sent. What do we do? “A family of disciples of Jesus who are sent to BLESS a pocket of people. Put another way: what does a community group do? They reach others by blessing them. What does BLESS mean? L—Listen to those people you are trying to reach. Learn about their lives and how you can love them well. E— Eat. Share meals with those people. Listen while you eat. Don’t think fancy, think family. S— Serve. Since you have listened and spent time with the people you are trying to reach, you’ll know how to serve them. Proactively come up with ways of serving these people. S— Story. Share your story with them. Share how a personal relationship with Jesus Christ has transformed your life. Share the story of Jesus Himself. Another way of talking about this is to say that CGs are communities reaching other communities. A 'pocket of people' is usually a network or neighborhood--a group of people connected by context. That context could be age, geography, or school. We've found the most tightly knit groups are organized around a neighborhood or a network (like a school). You might want to take a peak at our blog, get connected with one of our staff members, or attend a Pizza with the Pastor or Brookside Basics to learn more.